In the Akai MPK49 DVD we teach you how to use the many Akai MPK49 features like MPC-style Full Level, 12 Levels functions on its pads, and MPC Swing can be applied to both Note Repeat and Arpeggio functions. Tap Tempo and time-division buttons allow for real-time control of Note Repeat and Arpeggio clock speeds. The Akai MPK49 has 72 assignable controls, and you'll learn how to use the knobs, buttons, and sliders, with assignable inputs that include an expression pedal, footswitch, pitch bend and modulation wheel. 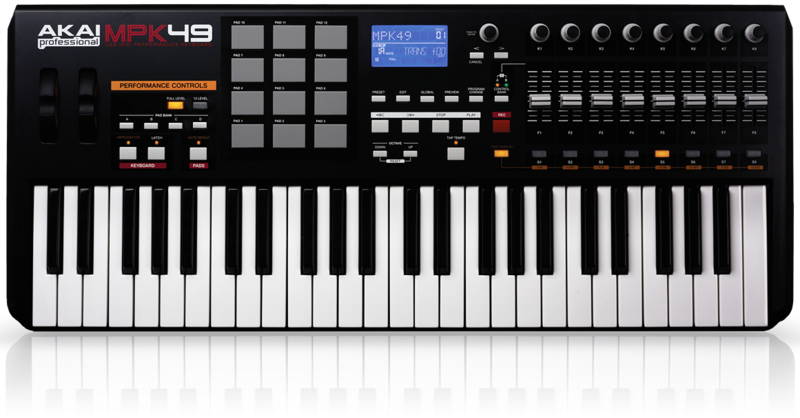 The 12 pads on the MPK49 are the same size as those on the MPC500 drum machine and react the same way. The MPK’s basic arpeggiator modes on include up, down, up/down cycling with the top and bottom notes in the pattern sounding twice each or just once , random, and chord, which will repeat the chord you hold down. The range goes up to three octaves. You select straight and triplet note values, from quarter-to thirty-second-notes, by holding down the dedicated Time Division button, then hitting one of buttons S1 through S8. This video includes a Demo with reason and Pro Tols we put it thru the motions just for this DVD and you will learn just what it can do to help you with your production.